Joe Perry is famed for non-monogamy when it comes to guitars - the Aerosmith legend has been spotted playing everything from Gretsch and BC Rich to Fender and Supro - but it appears the guitarist has finally settled down with a custom Gibson Les Paul. 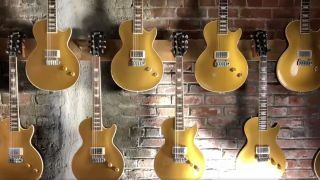 From what we can see, the guitar features a relic’d Goldtop finish and, unusually for a Les Paul, a Wilkinson floating tremolo system. Perry claims it’s been three years in the making, but it’s more like four by our count, since he gave us an early preview of the instrument back in a wide-ranging interview from 2015. 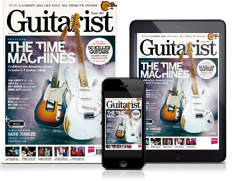 “It’s the best of the Stratocaster and the best of the Les Paul,” he told us. “Because I love the sound of the Les Paul and, ultimately, I love the way a Les Paul feels, but I love the ergonomics of a Strat. I love the whammy bar. So this new guitar I’m playing is a Les Paul from Gibson’s Custom Shop, with one pickup and a vibrato arm on it. As for when we’ll get to play with it, there’s no official word from Gibson just yet. But given its Custom Shop background, we’d wager it won’t be cheap. Epiphone version, please, Gibson?